As a society we all need to reach out and connect at some level. You just never know what affect a simple smile or ‘hello’ might have on someone else or on yourself for that matter. Rene McKenzie-Low introduces a project designed to encourage Sydney siders to just say ‘hi’. Bringing community together can be a challenge in any environment. One of the key elements is finding a shared value that speaks to everyone. Global issues surround the divide of many people’s opinions and belief systems. Whether it is personal or influenced by the media, what remains as the core value for most, no matter who they are, is that they want to feel safe and valued. More importantly, if you strip back all the worries and fears that surround such emotive topics you’ll find most just want to live in harmony. This is quite often a hot topic of discussion for community members that I speak with. Having had experience working amongst many different cultures, abilities, ages, youth, gender etc. when you get down to the nuts and bolts of what everyone’s core values are, we all want the same thing – acceptance. As the Community Engagement Manager of City West Housing, one of the constant topics discussed with tenants was for a project that would challenge people’s perceptions and interactions with those around them on a day to day basis. We wanted to create the opportunity to promote a positive exchange, connecting with the wider community irrespective of their particular group/demographic. So how do you start, and then promote, a project about social connection that is inclusive of everyone no matter who they are, what they believe or what abilities they may or may not have? You begin with a ‘Hi’. Simple you say? Actually, yes it is. For example, on an average day most of us go about our business with blinkers on, not giving much thought to those around us, whether it be during our commute to work, going to the shops, walking down the street etc. This has a direct impact on how we perceive the world around us. By challenging ourselves to connect with others on this level, if only by a mere smile or ‘hello’ we change not only our mindset, but can also potentially change the day of someone else for the better. Back in June last year I had the opportunity to pitch an idea to the City of Sydney about a project that was specifically designed to highlight the importance of social connection, in particular within a global city such as Sydney. I was then invited to attend the Living in Harmony’s 2015 ‘Thank you’ dinner to talk about the project, its potential to reach a diverse range of people and invite others to participate in the project. This is where the #justsayhisydney project began. Shortly thereafter a planning group was assembled which incorporated workers from the City of Sydney as well as volunteers from Italy, Spain and Vietnam who all believed in creating a meaningful project that brought people together from all walks of life. 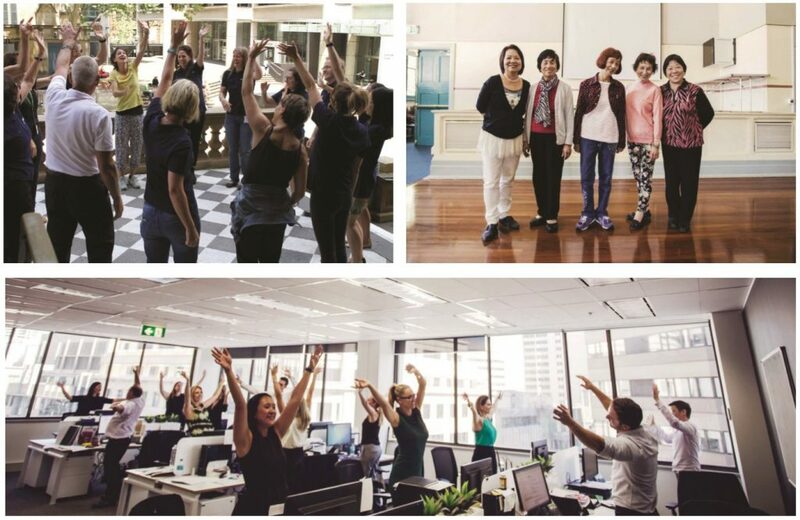 The basis of the project was that the project team meet with groups of people, either living or working within the City of Sydney, to demonstrate how the simple act of saying ‘hello’ or acknowledging others changes our own mindset, as well as having a direct impact on those we connect with. The project developed into three separate elements that incorporated a flash mob, film and photographic exhibition, with the view to capture the different sides of social connection within the participating groups and more importantly, the process. The project created an avenue of discussion which opened up into a greater feeling of connection and participation from the wider community that was inclusive of people from all demographics. The vision of the project team was that if we could potentially affect even just a few to change the way they see people in their day to day life, it would be a success! Over several months we began documenting through film and photography, various groups coming together and performing the choreography, all the while going through the process of breaking down particular barriers of each individual’s comfort level in connecting with others. What initially for some was an uneasy task soon became an environment of sharing and communicating on a nonverbal level, recognising their own impact towards each other. What was clear throughout the process and particularly when talking to the participants was in reality, how social connection affects us all without discrimination. Therefore by using a simple vehicle such as saying ‘Hi’ to engage people, we then were able to begin the process of connecting. On March 1, 2016 all the groups and interested parties in the project came together for the first time to perform the flash mob at Martin Place. This enabled all participants to come together to demonstrate a large scale public event featuring local Sydney community groups, workers, the general public as well as a sound-score by Sydney Choirs. The flash mob was a democratic expression through mass movement of people connecting. The #justsayhisydney project has been developed in partnership with the City of Sydney under the Living in Harmony banner in 2016. 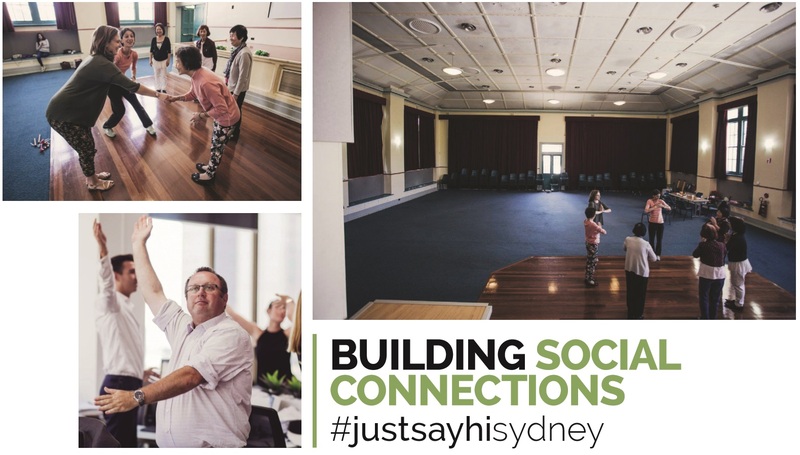 On Saturday, March 12th in Glebe, the #justsayhisydney project team will be launching our film/documentary and photographic exhibition featuring local Sydney community groups, a sound-score by Sydney Choirs and the general public. The launch will depict how social connectedness generates a positive feedback loop of social, emotional and physical well-being no matter who you are. Rene McKenzie-Low is the Community Engagement Manager at City West Housing.